Small Changes Inc - Wholesale Magazine Distributor - Small Changes Inc.
Small Changes' goal is to provide our retail customers with a wide range of domestic and foreign magazine titles that are timely, informative, and entertaining. We have an excellent reputation for efficient, quick, and transparent service that guarantees satisfaction. We recognize that our customers know best how to manage their magazine inventory and sales, and we delight in providing a strong, supporting role so that our customers' efforts will flourish. Our minimum order for magazines is 250 pieces. 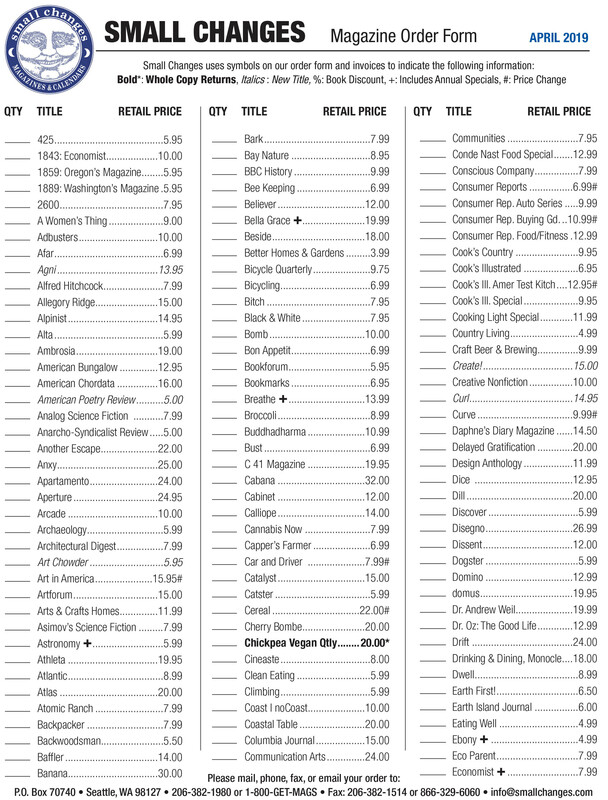 All magazines are sold fully returnable, and all but a handful of titles are cover returns. Our wholesale discount for magazines is 25%. For books and the Maritime Northwest Garden Guide, our wholesale discount is 40%. We have a wide range of display options, both standard and customizable. Payment terms are 30 days after credit is established. Small Changes' list of 485 magazine titles changes regularly, so we publish a Monthly Report describing potential new titles, dis-continued titles, call-ins, and other current and pertinent magazine news. We encourage our customers to partner with us to recommend new titles, as our stores play a vital role in our magazine selection. Addition of new titles from the Monthly Reports is dependent on customer orders. Restock: Small Changes provides customers with the vital ability to reorder issues of titles that they have sold out of, or are running low on, prior to the arrival of the next issues. Sales reports: We also provide movement reports for any time period, which allows customers to drop under-performing titles and increase better-sellers. Free samples of Magazines are available upon request: 1 per store per magazines, limit 3. All Magazine orders outside of the Seattle Metro area are shipped UPS. Seattle accounts are delivered by our staff, and full merchandising is available here as well as in Portland OR. Customer shipping frequency is based on sales volume.